We are here to provide support and ensure you are taken care of as part of our Maverick Family. As many local communities struggle with flooding, we know that some of you, your families and hometowns may be affected. Support is available. We are here to provide support and ensure you are taken care of as part of our Maverick Family. We ask that even if you are not in need of immediate support to be mindful of those students and colleagues on campus who may be struggling and need assistance. Please do not hesitate to share information about these resources to those who may need it or to reach out ask questions. Students who are in need of emergency housing are encouraged to email Dean of Students Cathy Pettid at cpettid@unomaha.edu to be immediately connected with support. Students in need of support can visit the Student Success website, email studentsuccess@unomaha.edu or call 402.554.3523. The Office of Military and Veteran Services also has a Support Scholarship available for all military-affiliated students (current service members, veterans, spouses, and dependents) who are experiencing unexpected hardship. Additional financial resources are also available through other military-affiliated organizations that OMVS can discuss with students. For additional questions or information regarding the deployment policy or resources available, please contact Leah Meyer in the Office of Military and Veteran Services at 402.554.4975 or email unovets@unomaha.edu. Some of our UNO military students have been or will be placed on temporary duty assignments. UNO strongly encourages all military students in deployment situations to work directly with their faculty instructors to coordinate absences, incompletes or alternative class assignments at the discretion of the instructor. The Office of Military and Veteran Services (OMVS) is also available for students and faculty to discuss other available options. Many students and their families are experiencing very difficult times. UNO Academic Affairs and Student Success are working with faculty to make sure students are provided flexibility and leniency during this crisis. If you are a student in need of support, please work directly with Cathy Pettid, dean of students, by emailing cpettid@unomaha.edu, or Angie Sargus, executive assistant to the senior vice chancellor for academic affairs, by emailing asargus@unomaha.edu. Employees can find of resources through the UNO Faculty Employee Assistance Program (FEAP), which provides benefits-eligible employees and their eligible dependents with confidential counseling and referral services. This also includes an Emergency Loan Fund for unexpected financial emergencies. Contact Human Resources at 402.554.2321 or unohr@unomaha.edu for additional details. UNO Human Resources also works closely with financial advisors from Fidelity and TIAA-CREFF to provide hands-on financial planning through personal on-campus visits. Faculty requesting additional information or assistance, please contact Regina Toman, assistant to the senior vice chancellor for academic human resources at rtoman@unomaha.edu or 402.554.2262. Staff requesting additional information or assistance, please contact UNO Human Resources. The Maverick Food Pantry is available as a resource to all UNO and UNMC students, faculty and staff. The pantry offers food and personal hygiene products to all members of the UNO community by providing healthy, organic, and culturally sensitive items. Requests for food packages can be submitted through an easy online form twice a week. Some of you on campus may also be feeling anxiety or distress due to the flooding. UNO Counseling and Psychological Services (CAPS) is here to ensure you have the support you need. CAPS can be reached at 402.554.2409 or unocounseling@unomaha.edu. UNO students, faculty and staff impacted by the recent flooding can use the shower and towel services for free in the Health and Kinesiology Building. Simply stop by the Guest Services desk upon your initial visit and the staff will assist in getting you access to the facility. If you have additional questions, please email Angelica Jensen aljensen@unomaha.edu or call 402.554.2539 and ask to speak to Angelica. 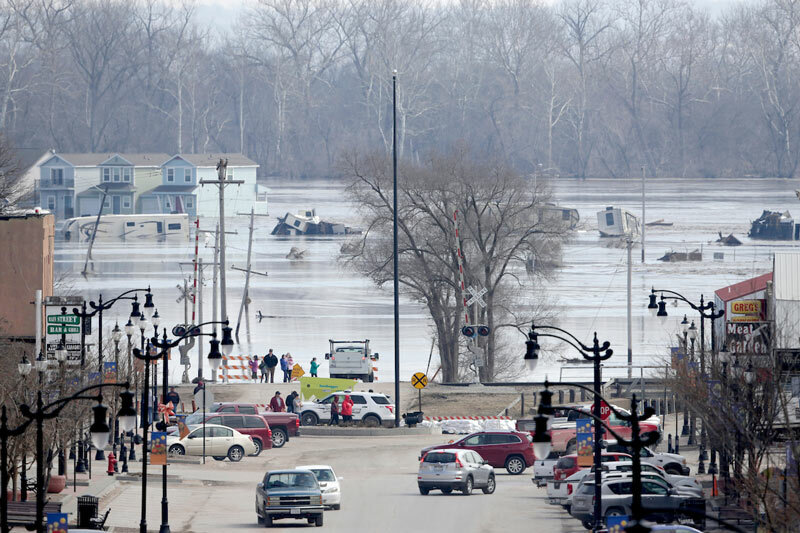 The University of Nebraska at Omaha, University of Nebraska Medical Center and Nebraska Medicine have collaborated to open a Flood Relief Donation Management Center. The donation center is located at 601 South Saddle Creek Road. The Flood Relief Donation Management Center is adjusting its hours. Beginning Friday, March 29, the center will be open from 10 a.m. to 4 p.m. on weekdays to accept and distribute donations. The center is collecting donations for specific items and also is distributing supplies to anyone impacted by the floods. Go to the flood aid page for a complete list of items being collected. Volunteers are no longer needed to help operate the center as staffing needs have been met. Monetary donations will no longer be accepted. The University of Nebraska at Omaha (UNO) is asking the campus community to consider supporting ongoing flood relief efforts.